Running AutoIt-Scripts on Windows Server? I'm using many (AutoIt-)Scripts on Windows Servers (NT, 2000, 2003), mostly installed as services - and i'm very happy with it. Now, "somebody" said to me that he would not recommend to run AutoIt-Scripts on Servers - AutoIt would be not delevoped for operational servers. Is there anybody (maybe from the developers) who can confirm this? Thanks for all advices and recommendations. I don't see a problem with it. Seems fine to me. Who is "someone" and do you trust their opinion ? I'm on computers (systems engineer), and the "somebody" is working with me in the same group. I do not trust this, but maybe my chief does! And that would kill many of my (good working) scripts, or at least stop new ones - or sure! I had a similar issue years ago where one of the developers didn't like the fact that I wrote my own programs to streamline my workload. It became a small issue, so I showed them the source to prove it didn't have any "bad" code in it. They shut up and let me do pretty much what I wanted after that. The developer got a big "why haven't YOU done something like this? In my case, Mr. "Somebody" rather trusts my code than AutoIt. He (probably) thinks AutoIt isn't "serious" enough for servers. He recommends me to use VBScript. 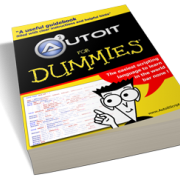 My point is AutoIT is a trustworthy product and much easier to implement than VBS, oh and it's FREE. The only issue I can think of: You probably won't get as many false positives from anti-virus programs for VBScripts as for AutoIT. You need to discuss this a bit more. There must be some reasoning behind the sweeping statement.